Grizzly bear watching prior to August 25th is along the shore of Knight Inlet, the Glendale River estuary and in the Glendale River. 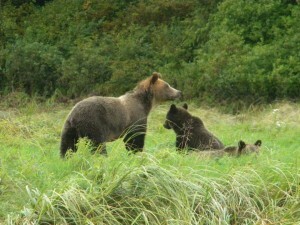 On these tours your are at eye level with the bears as they forage on the beach often with first year cubs. These cubs are may be only five months old and are much smaller than those in the previous day’s posting. But even at that age the cubs learn by copying their mother. This is an early season photo as you can see the fur that was rubbed of in the den has not had time to regrow. About 35 meters (yards) from the viewing platform we use after August 24th a tree has fallen across a small channel in the river. 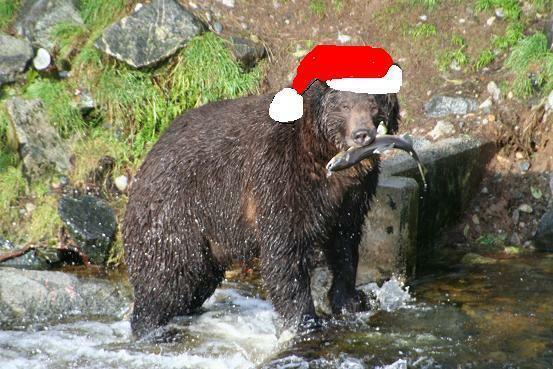 This tree has become a pathway for the grizzly bears that do not want to get their feet wet. That means bear cubs because they tend to avoid the water if they can. 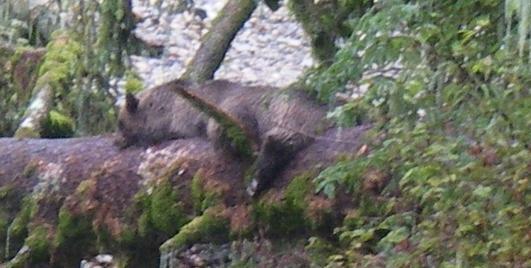 They use the log to watch their mother as she fishes in the river below and if she is too slow in catching a salmon it is a good place to rest. 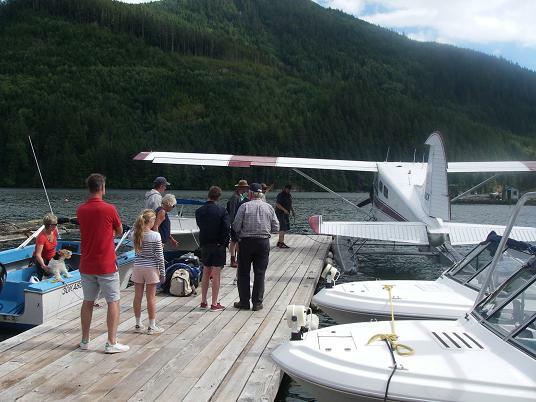 At the Grizzly Bear Lodge’s dock the boats are double tied to make room for the plane. The departing guests are waiting on the dock as it has been explained that there are not enough beds even if their schedule would allow them stay another night. 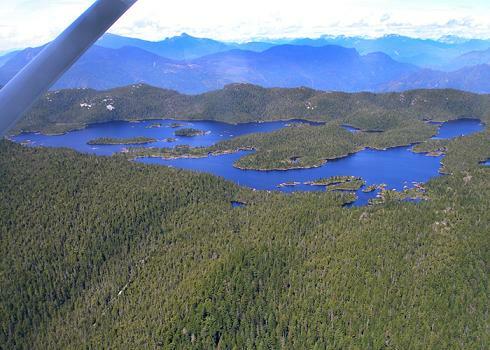 The flight you catch in Campbell River leaves the harbour about 3:00 and arrives at the lodge about forty-five minutes later. As your luggage is loaded you may have notice that the extra room was filled with the all important groceries to keep the “larder” stocked. 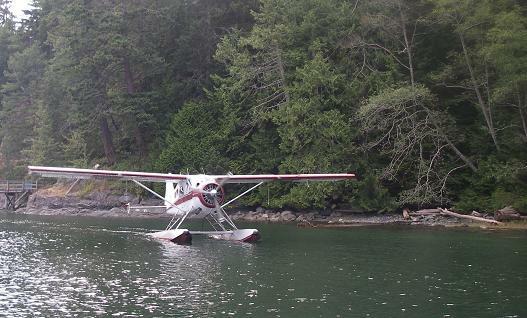 The size of the plane will depend on the number of guests and could be a Beaver or a Cessna. 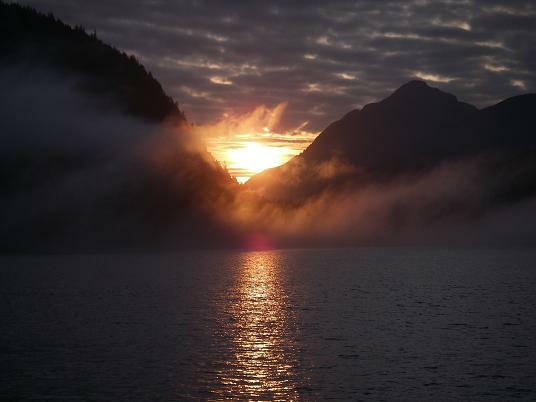 Not a common sight but magnificent when it does occur – sunrise photos from the front deck of Grizzly Bear Lodge. Guides are up by 6:00 or 6:30, depending on the time of the season, to make fresh coffee and to finish setting the table for breakfast. Some guests are up when we rise others are called an hour later. 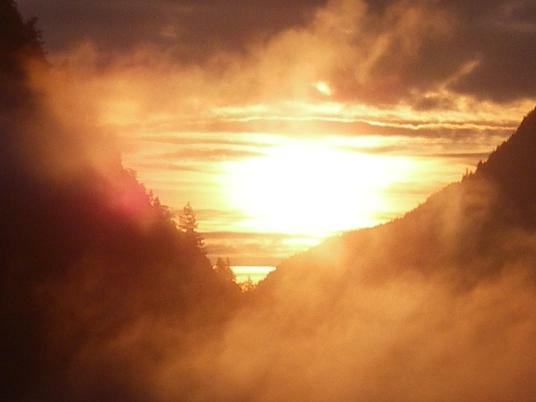 In this case the “early bird does get the worm” (sunrise). This mother grizzly bear with second year cubs was located part way up the Glendale River estuary. 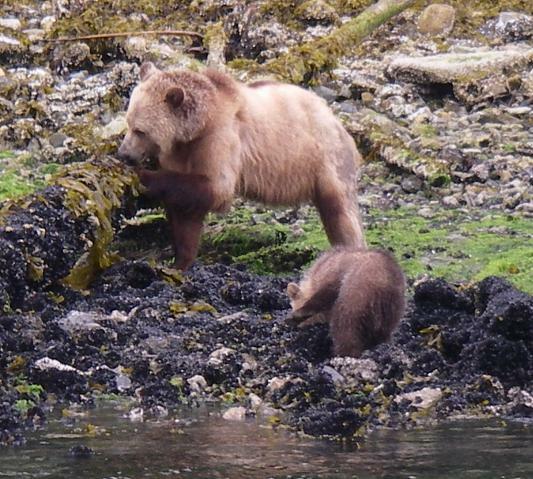 The viewing of grizzly bears in the spring and early summer occurs along the shore of Knight Inlet and frequently in a river estuary. It is about an hour and fifteen minute boat ride from the lodge to a float where we transfer to a 3.5 meter (sixteen foot) flat bottom skiff which provided stable viewing for the bears along the shore. As the tide rises and because the skiff has a very shallow draft we are able to proceed up the river and follow the bears into the taller sedge grass.